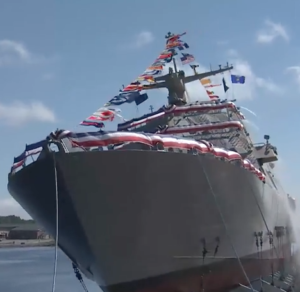 MARINETTE, Wis. (AP) — The U.S. Navy has launched a new littoral combat ship in Wisconsin. The future USS Wichita was christened Saturday at the shipyard in Marinette, where it was built. The ship’s sponsor, novelist Kate Lehrer, wife of former “PBS NewsHour” anchor Jim Leher, broke a champagne bottle across the ship’s bow just before launch. U.S. Sen. Tammy Baldwin of Wisconsin was keynote speaker. The ship will undergo additional outfitting and testing at Fincantieri Marinette Marine before its anticipated delivery next year. The speedy warship is the nation’s 13th littoral combat ship. The team led by defense contractor Lockheed Martin has six Freedom-class ships — which have a steel monohull — under construction in Marinette, and is procuring materials for three more. It’s the third U.S. Navy ship named USS Wichita.